Hello there, my name is Lee and I am currently working with Bright Hand Pictures who are producing a show for Sky Television Channel; Current TV. our flyer and if you think you're up for it, just contact us! 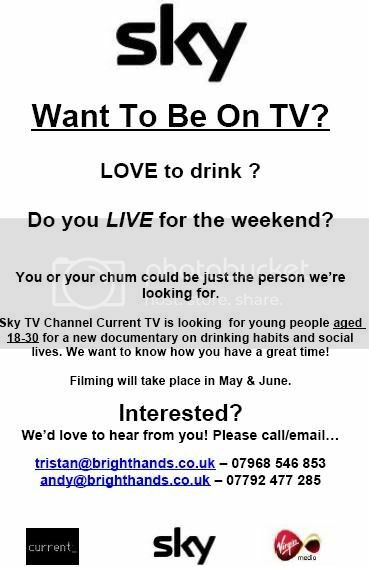 Want To Be On TV? LOVE to drink? Do you LIVE for the weekend? You or your chum could be just the person were looking for. new documentary on drinking habits and social lives. We want to know how you have a great time! Filming will take place in May & June. Interested? Wed love to hear from you!